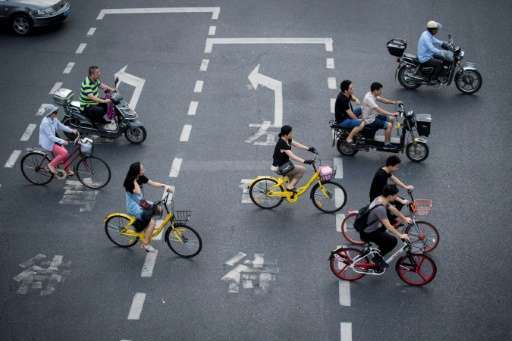 China on Thursday issued national guidelines governing bike-sharing operations to nurture a new industry credited with spurring a transport revolution while addressing mounting complaints over an accumulation of millions of bikes on city streets. Jointly issued by the Ministry of Transport and nine other ministries and agencies, the guidelines urged cities to come up with plans for integrating use of the rentable bikes into overall traffic planning, in the latest official vote of confidence for the sector. But it also called on authorities to tighten controls on parking of bikes, devise systems to penalise offenders, develop standards on maintenance and bicycle life spans, and banned their use by children under 12. The bikes, which can be unlocked by GPS using a mobile phone app and left anywhere, have been seized upon by commuters as a cheap and convenient way to navigate congested cities. But the stampede into the market by providers has cluttered sidewalks in Shanghai, Beijing, and many other urban centres with bikes that are often broken down or left haphazardly parked by users outside of designated zones. Safety issues also have arisen, including the reported death of a Shanghai primary school student who was struck by a bus in March. Shanghai and Tianjin had announced their own regulations in July, mandating a service life of three years for bikes and requiring companies to hire at least one maintenance employee for every 200 bicycles, Xinhua news agency reported. The sector has exploded from virtually nothing about a year ago into an urban transport phenomenon. More than 10 million such bikes are estimated to be on the streets, operated by more than two dozen companies. China's government has thrown its support behind the concept as a green transport option, and leaders like Ofo and Mobike have attracted increasingly large amounts of venture capital in a series of fund-raising rounds. Ofo raised more than $700 million in its latest round, the company told AFP Thursday, after rival Mobike raked in $600 million in June. Both had already raised hundreds of millions in earlier rounds. The new national guidelines, expected to be implemented by city authorities, also urged closer government supervision of bike-share companies' financial operations to head off rising customer disputes, as well as establishment of mechanisms for handling complaints. Ofo released a statement "warmly welcoming" the guidelines, and pledged to cooperate. Xinhua news agency last month quoted a Shanghai consumer affairs official saying there were more than 2,600 complaints about shared bikes in the city alone in the first four months of 2017, nine times more than the same period last year. It also quoted officials saying Shanghai had more than a million such shared bikes in operation, twice what was needed, but far too few maintenance personnel to deal with broken-down bicycles.